tl;dr: The dapp market, though still small, is growing. Gambling and betting is taking the lead hinting at future disruption. Today, the App Store generates over $22 billion in revenue, 5x what it did ten years ago. 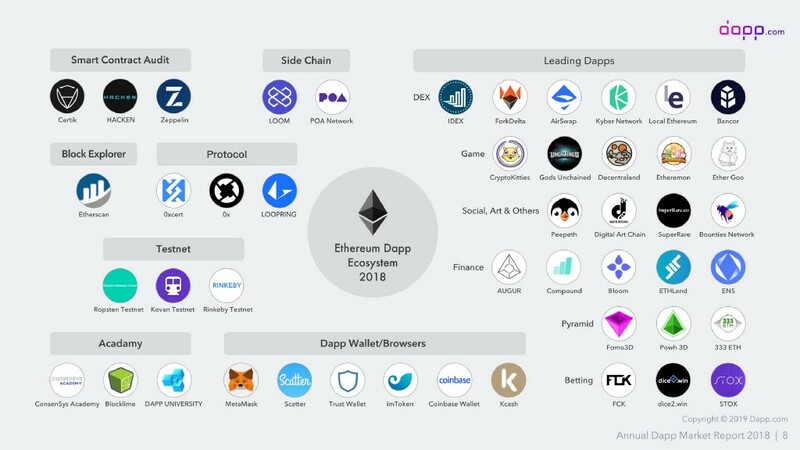 Last year, according to a recently released report by Dapp.com, was the “Year of the Dapp” and they contributed $6.7 billion throughout 2018. The date of the Ethereum ICO was August 17, 2015, not even four years ago, and today there are more than 1,000 applications running on it. Perhaps even more impressive is what is happening in both EOS (which I have covered here) and Tron. At the time of this writing, the top 24 dapps are running on one of those 2 blockchains. the number of dapp users is growing. A few weeks ago, I shared a report that showed about 10k dapp users per month. Now, the top 5 dapps have 30k users per day with $100k of transaction volume. we are witnessing the earliest stages of the disruption of the online gambling and betting industries because of the “provably fair” nature of these games. Imagine what happened to the Internet when AOL sent out CDs to everyone. Perhaps this is all confirmation bias for my crypto thesis, but what I love about blockchain is that you can verify all of the numbers for yourself. In ten years from now, we’ll be talking about the global dApp store and everyone will know what it is. Signs of Life in the dApp Market was originally published in Data Driven Investor on Medium, where people are continuing the conversation by highlighting and responding to this story. Is Satoshi Nakamoto Turning in his Virtual Grave?